The Sun Conure (Aratinga solstitialis) was recently uplisted on the IUCN Red List from Least Concern to Endangered, owing to the very rapid reduction in the size of its population that has occurred in the last three decades. Project and progress: In 2009 the World Parrot Trust recognized this urgency and funded biologist Toa Kyle's census of the wild population. A survey was begun by WPT's Dr. Jamie Gilardi in May of 2008, and continued by Toa Kyle in southern Guyana a year later. He found that one population, in the Karasabai region of Brazil, is actually growing in numbers. Overall however, the study concluded that the general population has declined significantly, and is in urgent need of protection. Outcomes: WPT is working to encourage protection and recovery of this species. It is also suggested that the species be listed on CITES Appendix I. Work to prevent cross-border trade quickly and protect the species' prefered habitat should begin. Surveys should be conducted to locate other important additional populations. Captive breeding is an option that would help the recovery of populations. Where found: Restricted to C Guyana and Roroaima, far NE Brazil; also recorded in NW Surinam and SE Venezuela. 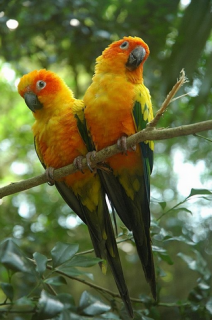 History: The Sun Conure (Aratinga solstitialis) is found up to 1200m (3936 ft) in savanna or dry forest with palm groves. Also found locally in flooded varzea scrub on both banks of the Amazon River. After decades of poaching and habitat loss the total population probably now numbers no more than a couple of thousand individuals at the very most, but probably fewer, with at least 90% of these in Brazil, within a restricted, decreasing and fragmented range (Laranjeiras et al. 2011). Their group roosting behaviour, recently discovered, may be exploited by poachers - nets placed over cavities at night trap many birds when they attempt to leave the cavity first thing at dawn. Ecology: Birds feed on fruit, berries, nuts, buds and flowers; also legume pods, red cacti fruits and Malpighia berries in groups of up to 30 where food is abundant. WPT researcher Toa Kyle discovered tree cavity roosting behaviour during his research in 2009.